Section of Nephrology, Yale University School of Medicine, New Haven, Connecticut. Signaling from the primary cilium regulates kidney tubule development and cyst formation. However, the mechanism controlling targeting of ciliary components necessary for cilium morphogenesis and signaling is largely unknown. Here, we studied the function of class II phosphoinositide 3-kinase-C2α (PI3K-C2α) in renal tubule-derived inner medullary collecting duct 3 cells and show that PI3K-C2α resides at the recycling endosome compartment in proximity to the primary cilium base. In this subcellular location, PI3K-C2α controlled the activation of Rab8, a key mediator of cargo protein targeting to the primary cilium. Consistently, partial reduction of PI3K-C2α was sufficient to impair elongation of the cilium and the ciliary transport of polycystin-2, as well as to alter proliferation signals linked to polycystin activity. In agreement, heterozygous deletion of PI3K-C2α in mice induced cilium elongation defects in kidney tubules and predisposed animals to cyst development, either in genetic models of polycystin-1/2 reduction or in response to ischemia/reperfusion-induced renal damage. 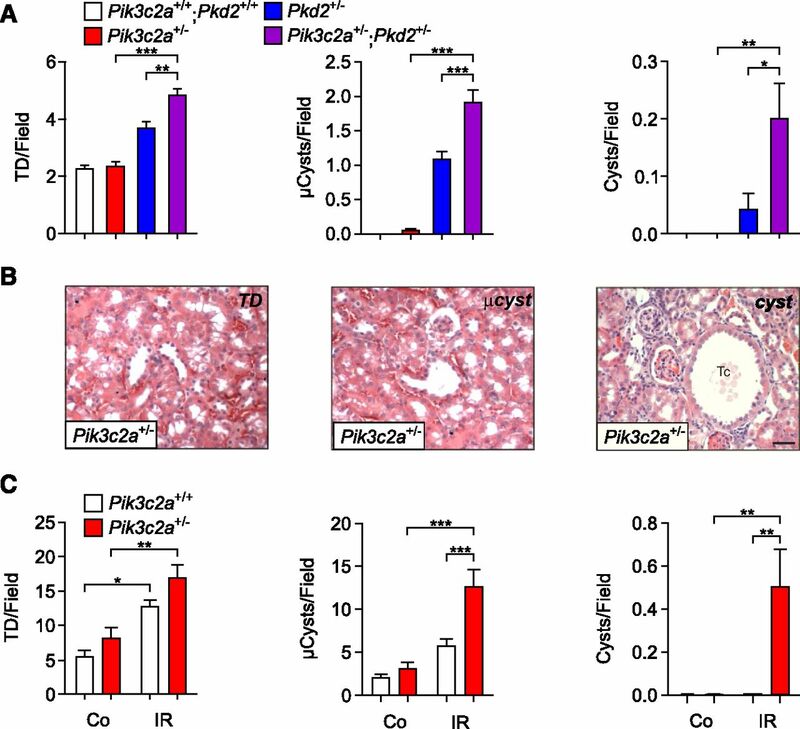 These results indicate that PI3K-C2α is required for the transport of ciliary components such as polycystin-2, and partial loss of this enzyme is sufficient to exacerbate the pathogenesis of cystic kidney disease. Transport of polycystins to the primary cilium is tightly regulated and several mediators of different trafficking steps have been identified to direct vesicles to the primary cilium base.3,15–17 In this region, known as basal body, a selective barrier regulates entry of specific proteins inside the ciliary compartment.18,19 A key player in this selective entry of ciliary components is the small guanosine triphosphatase (GTPase) Rab8.19 Consistently, silencing of Rab8 impairs transport of proteins required for ciliogenesis,20 whereas a dominant-negative form of Rab8a prevents ciliary delivery of polycystin-2.21 Rab8 activation is thus a crucial step for correct cilium biogenesis and sensory function. Guanosine triphosphate (GTP) loading of Rab8 occurs at the ciliary base and is mediated by the Rab GTP exchange factor Rabin8.22,23 Localization and function of this GTP exchange factor critically depends on the activation of another Rab, Rab11.20,24 We recently showed that the phosphatidylinositol-3-kinase (PI3K) of class II, PI3K-C2α, acts not only in the endocytic compartment25 but also at the pericentriolar recycling endosomal compartment (PRE) at the base of the primary cilium where it promotes Rab11 activation upstream of Rab8.26,27 Consistently, genetic inactivation of Pik3c2a, the murine gene encoding PI3K-C2α, leads to embryonic lethality with typical signs of ciliary dysfunction such as laterality defects and impaired Sonic hedgehog pathway activation.26 The severity of the phenotype has precluded the analysis of ciliary dysfunction in adult organs but mouse mutants weakly expressing a truncated form of PI3K-C2α display kidney abnormalities including tubular dilations.28 Although this condition typically precedes kidney cyst formation, the effects of PI3K-C2α loss on cystogenesis are currently unknown. To determine whether changes in PI3K-C2α expression could impact on kidney tubule primary cilia and renal cystogenesis, we analyzed the effects of PI3K-C2α downregulation in vitro in inner medullary collecting duct 3 (IMCD3) cells and in vivo in heterozygous null mice. We found that decreased PI3K-C2α expression impairs Rab8-dependent transport of ciliary components, including polycystin-2. Consistently, PI3K-C2α heterozygous mice showed morphologic defects of kidney cilia and enhanced renal cyst formation when challenged with kidney ischemic insults or crossed with either Pkd2 or Pkd1 heterozygous mutants, thus indicating that PI3K-C2α reduction can predispose to kidney cystic disease. In ciliated IMCD3 murine kidney-derived cells, PI3K-C2α was enriched in vesicular structures surrounding the base of the primary cilium (Supplemental Figure 1A). This localization overlapped with that of two markers of the PRE, Rab11 and Rab8 (Supplemental Figure 1, B and C). Rab11 and Rab8 are activated in cascade20,24 and PI3K-C2α promotes triggering of Rab11.26 Consistently, shRNA-mediated PI3K-C2α silencing in IMCD3 cells caused a significant decrease in Rab11 activity, assessed by a FIP3 pull-down assay.26 The use of two sh-RNAs able to target the Pik3c2a transcript with different efficacy (Supplemental Figure 2A) showed a correlation between the severity of PI3K-C2α loss and the impairment of Rab11 activation (Supplemental Figure 2B). Active Rab11 is required for Rab8 triggering and subsequent ciliogenesis.23 Consistently, loss of PI3K-C2α prevented Rab8 ciliary targeting, but constitutive activation of Rab8 (through the expression of Rab8Q67L) was sufficient to overcome this defect (Figure 1). PI3K-C2α promotes localization of active Rab8a at the primary cilium. Immunofluorescence analysis of control and Sh1-IMCD3 cells transfected with either GFP-Rab8 or the constitutively active mutant GFP-Rab8Q67L(green). Cells were starved for 24 hours and forming cilia were stained with anti-acetylated tubulin (red) and analyzed for the presence of Rab8. In control cells both the wild-type Rab8 and Rab8Q67L were localized in cilia. On the contrary, in Sh1-IMCD3 cells, only the constitutively active Rab8Q67L could be found at cilia. Bar=3 μm. PI3K-C2α, phosphoinositide 3-kinase-C2α; IMCD3, inner medullary collecting duct 3. Inactivation of Rab8 is expected to cause ciliary shortening.23 Consistently, cilium length was significantly reduced in Sh1-IMCD3 cells after 48 hours of starvation (Figure 2, A and B, Supplemental Figure 3A). Given that Sh2 was more effective than Sh1 (Supplemental Figure 2A), severity of cilium shortening in Sh2-IMCD3 cells correlated with the extent of Pik3c2a silencing (Figure 2, A and B). In addition, a specific rescue of ciliary length was detected in Sh1-IMCD3 transfected with constitutively active Rab8Q67L but not wild-type Rab8 (Figure 2, C and D). 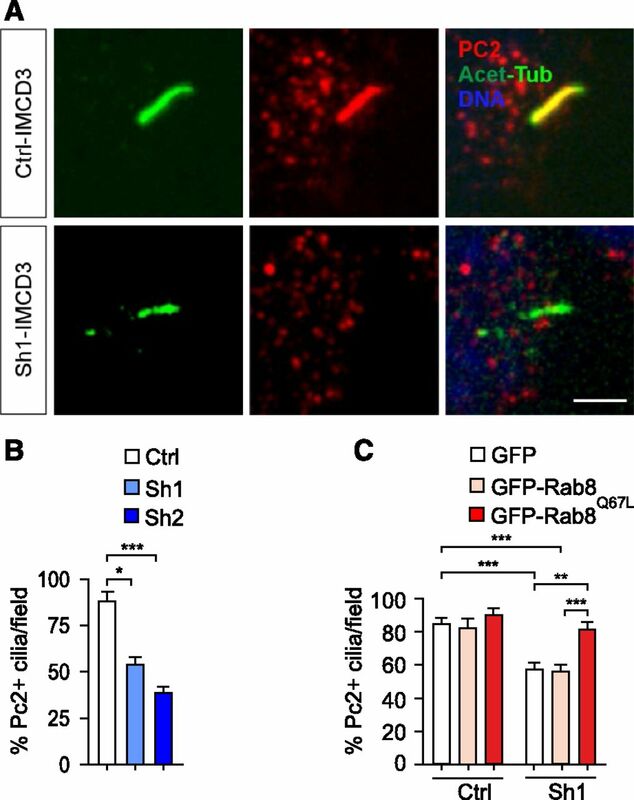 In agreement with Rab8 localizing to the ciliary shaft during early ciliogenesis (Figure 1), but rarely to completely elongated cilia,24 neither wild-type Rab8 nor Rab8Q67L were observed on cilia of 48 hours-starved control and Sh1-IMCD3 cells. These results demonstrate that PI3K-C2α controls primary cilium elongation by promoting the Rab11/Rab8 cascade activation. PI3K-C2α is required for Rab8-mediated cilium elongation. (A) Representative images of cilia by immunofluorescence of acetylated-α-tubulin (red) in 48 hours-starved control and Sh1-IMCD3 cells. Bar=3 μm. (B) Measurement of primary cilium length assessed by immunofluorescence in control, Sh1 and Sh2-IMCD3 cells (n=150/group). (C) Rescue of ciliary length defects in Sh1-IMCD3 cells by expression of the constitutively active mutant of Rab8 (GFP-Rab8Q67L). Transfection of either empty-EGFP or wild-type GFP-Rab8 is used as control (n=40 cilia/group). (D) Representative images showing that Sh1-IMCD3 cells transfected with GFP-Rab8Q67L (green) display longer cilia (red) than non-transfected cells (right panel), while wild-type GFP-Rab8 does not affect cilium elongation (left panel). EGFP, enhanced green fluorescent protein. Rab8 is required to deliver ciliary components, including polycystin-2.21 Thus, polycystin-2 positive cilia were scored in the same cells where ciliary length was measured. In agreement with a dose-dependent effect of PI3K-C2α on protein entry into cilia, 40% and 50% reduction in the number of polycystin-2 positive cilia was observed in Sh1 and Sh2-IMCD3 cell lines, respectively (Figure 3, A and B). Interestingly, polycystin-2 positivity and length were inversely correlated, with polycystin-2 being detected on the rare longest cilia (Supplemental Figure 3A). To test whether the observed localization defect was due to impaired Rab8 activation, rescue experiments were attempted using the constitutively active form of the protein (Supplemental Figure 3B). Transfection of Rab8Q67L was able to restore the number of polycystin-2 positive cilia in Sh1-IMCD3 cells, while a wild-type Rab8 was not (Figure 3C). These results indicate that PI3K-C2α promotes Rab8-dependent localization of polycystin-2 into cilia. PI3K-C2α is required for Rab8-mediated ciliary localization of polycystin-2. (A) Representative immunofluorescence of polycystin-2 (PC2, red) localization at cilia (acetylated-α-tubulin, green) of 48 hours starved control and Sh1-IMCD3 cells. Bar=3 μm. (B) Quantification of the percentage of PC2 positive cilia in control, Sh1 and Sh2-IMCD3 cells (n=40). (C) Rescue experiment of PC2 ciliary localization in Sh1-IMCD3 cells. Cells transfected with either empty-EGFP, wild-type GFP-Rab8, or GFP-Rab8Q67L were starved for 48 hours, then PC2-positive cilia were visualized by immunofluorescence as shown in Supplementary Figure 3. The percentage of PC2 positive cilia was calculated as: the number of PC2 positive cilia/ten GFP-positive ciliated cells. At least 60 cilia per group were scored. 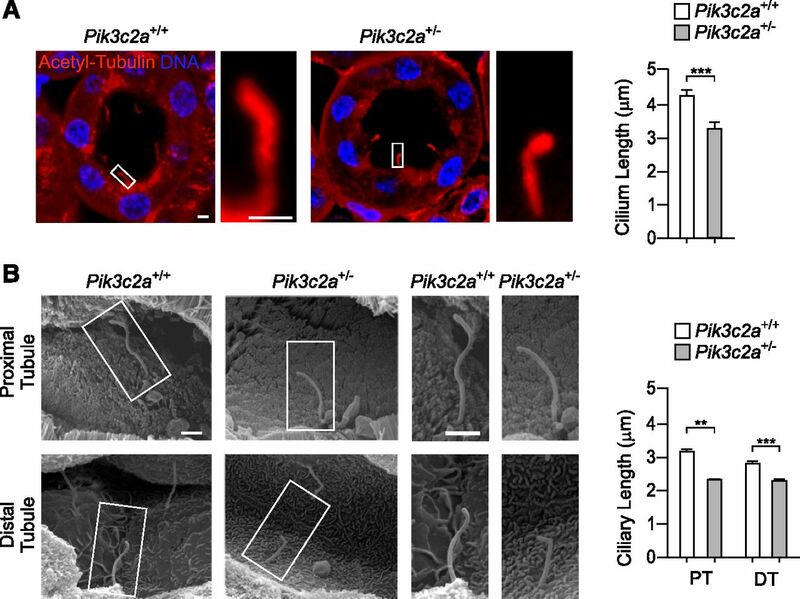 Ciliary defects due to reduced PI3K-C2α levels were next investigated in vivo in the kidney of Pik3c2a heterozygous mice. Pik3c2a+/− mutants normally reached adulthood and showed a 50% decrease in the amount of PI3K-C2α in the majority of tissues, including brain, testis, pancreas, muscle, fat, and kidney (Supplemental Figure 4). Inspection of cilia in renal tubules of 2-month-old Pik3c2a+/− mice showed an overall reduction of ciliary length (Figure 4A). Specific analysis using scanning electron microscopy imaging showed a 30% reduction of ciliary length in proximal and a 20% shortening in distal tubules (Figure 4B). Altogether, these data show that heterozygous deletion of Pik3c2a is sufficient to induce defects in cilium morphology, thus indicating that PI3K-C2α is haploinsufficient in kidney tubules. Pik3c2a+/− mice show shorter cilia in proximal and distal renal tubules. (A) Representative micrographs of cilia in wild-type and Pik3c2a+/− kidney tubules, detected by immunostaining with acetylated-α-tubulin (red) and DNA (DAPI, blue). Bar=2 μm. Graph shows the quantification of ciliary length in tubules of wild-type and Pik3c2a+/− mice. n=100 cilia per /genotype. (B) Imaging by scanning electron microscopy of proximal and distal tubule primary cilia in kidneys of 6-week-old wild-type and Pik3c2a+/− mice. Quantification of 20 (proximal tubule, PT) and 75 (distal tubule, DT) cilia per genotype are provided on the right. Bar=1 μm. Although low antibody sensitivity prevented the analysis of polycystin-2 localization in kidney cilia, in vivo study of ciliary polycystin-2 succeeded on ventral node cilia of mouse embryos (Supplemental Figure 5). With this staining, Pik3c2a−/− embryos showed a severe defect of polycystin-2 ciliary localization compared with wild-type controls. This demonstrates that the lack of PI3K-C2α affects ciliary targeting of polycystin-2 not only in IMCD3 cells (Figure 3), but also in vivo (Supplemental Figure 5). Polycystin-2 deficiency is associated with kidney cystic phenotype and partial reduction of polycystin-2 levels is a weak stimulus to cyst formation. However, spontaneous development of a few cysts can occur in Pkd2 heterozygous mice.29 To test if PI3K-C2α and polycystin-2 functionally interact in kidney cyst development, Pik3c2a+/− mice were crossed with heterozygous mutants (Pkd2+/− mice) for a polycystin-2 knock-out allele.29 Histology of the kidney at 3 months of age did not reveal a spontaneous propensity of Pik3c2a+/− mice to develop cysts, while two out of eight Pkd2+/− mice showed overt monolateral kidney cysts. However, Pik3c2a and Pkd2 double heterozygotes (Pik3c2a+/−; Pkd2+/−) showed a significantly enhanced rate of cystogenesis, with detection of cysts in six (three monolateral and three bilateral) out of ten double heterozygous mice. In further agreement, a detailed blind scoring of the number of tubular dilation, microcysts and cysts showed that those lesions were significantly more frequent in Pik3c2a+/−; Pkd2+/− double mutants than in single heterozygotes (Figure 5A). In agreement with polycystin-1 and -2 being strictly associated, heterozygous loss of Pik3c2a enhanced cyst development not only in Pkd2+/− but also in Pkd1+/− mice30 carrying a heterozygous deletion of the gene encoding for polycystin-1 (Supplemental Figure 6, A and B). This genetic evidence demonstrates that PI3K-C2α functionally cooperates with the polycystin complex to prevent cyst formation. Heterozygous loss of Pik3c2a enhances cysts formation in Pkd2+/− mice and after I/R. (A) Quantification, using the TD/cyst index, of tubular dilations (TD, left), microcysts (μCysts, middle) and cysts (right). n=7 wild-type, n=7 Pik3c2a+/−, n=8 Pkd2+/− and n=10 Pik3c2a+/−;Pkd2+/− mice. Mice were analyzed at 3 months of age. (B) Representative micrographs of tubular dilations (left), a microcyst (middle), or a cyst (right panel), recovered in Pik3c2a+/− outbred mice. Tc, tubular cyst. Bar=100 μm. (C) Quantification, using the TD/cyst index, of tubular dilations (TD, left), microcysts (μCysts, middle), and cysts (right). Ctrl, untreated kidney; I/R, ischemia reperfusion. n=7 wild-type and n=8 Pik3c2a+/− outbred mice. Heterozygous loss of polycystins not only predisposes to cyst formation31 but also exacerbates cystogenesis in response to tubular-cell damage such as renal ischemia/reperfusion (I/R).32,33 To test whether heterozygous mutation of Pik3c2a enhanced the propensity to develop cysts consequent to I/R, the monolateral renal artery was temporarily occluded for 35 minutes. To confirm result specificity, the effect of Pik3c2a haploinsufficiency after I/R treatment was evaluated in both outbred C57BL6/129Sv and inbred mice, obtained by backcrossing to BALB/c mice for eight generations. First, the extent of tissue damage was evaluated by quantifying tubular necrosis in tissue sections of wild-type and Pik3c2a+/− kidneys 48 hours after ischemia (Supplemental Figure 7A). The number of necrotic tubules (NT) and casts (CS) was similar in wild-type and mutant kidneys in both backgrounds (Supplemental Figure 7, B and C), thus indicating that a reduction of PI3K-C2α does not affect the initial damage due to the ischemic treatment. Next, I/R treated kidneys were analyzed after 6 weeks of recovery. Ischemic damage in both genotypes caused a reduction in kidney weight (Supplemental Figure 8A) and an increase in fibrosis (Supplemental Figure 8, B and C). However, while both wild-type and heterozygous mice showed a general enlargement of tubules, mutant mice but not wild-type controls developed overt cysts (Supplemental Figure 9A). To provide a quantitative assessment of kidney remodeling, tubular dilations, microcysts and cysts were scored (Figure 5B). Tubular dilations and microcysts were significantly more abundant in Pik3c2a+/− than in wild-type controls in both outbred and inbred backgrounds (Figure 5C, Supplemental Figure 9B). Furthermore, overt cysts could only be scored in heterozygous mutants (Figure 5C, Supplemental Figure 9B), thus indicating that the heterozygous loss of PI3K-C2α is sufficient to predispose to cyst development in response to ischemic injury. To understand the trigger for cyst formation, cystogenic pathways known to be upregulated in the cyst lining epithelia of Pkd1 and Pkd2 mutants were initially analyzed in protein extracts from Pik3c2a+/− and control kidneys of BALB/c mice at 48 hours after I/R. Phosphorylation of Erk (p42–44 MAPK) and S6rp were increased twofold in Pik3c2a+/− kidneys (Figure 6, A and B), thus demonstrating that the MAPK and mTOR pathways are more active in these organs. Polycystins also inhibit proliferation by upregulating the cyclin-dependent kinase inhibitor p21.34 Consistent with impaired polycystin signaling in Pik3c2a+/− kidneys, protein levels of p21 were significantly decreased in mutant organs after I/R (Figure 6, A and B). Furthermore, the amount of proliferating tubular cells in sections from Pik3c2a+/− kidneys, although equal to wild-type numbers at 48 hours, was two times higher than controls at 6 weeks after I/R (Figure 6, C and D). In line with these findings, the majority of cysts from Pik3c2a+/− kidneys stained positive for pErk and pS6rp (Figure 6E). Altogether, these results show that proliferative signals normally limited by polycystins are uncontrolled in Pik3c2a+/− kidneys, thus generating a condition known to favor cyst development. Uncontrolled proliferative signaling in the tubules of Pik3c2a+/− kidneys after I/R. (A and B) Western blot analysis of pathways regulating proliferation in wild-type and Pik3c2a+/− samples from either control (ctrl) or ischemic (I/R) kidneys at 48 hours after treatment. Activation of the MAPK pathway is investigated through analysis of pErk, while phosphorylation of S6rp shows the activation of the mTOR pathway. p21 is a cyclin-dependent kinase inhibitor upregulated after ischemic injury of the kidney. A representative western blot (A) as well as protein quantification (B) of n=8 wild-type and n=8 Pik3c2a+/− mice are shown. (C and D) Analysis of proliferation was achieved by immunohistochemical staining of PCNA in sections of either control (ctrl) or ischemic (I/R) kidney from wild-type and Pik3c2a+/− mice. Representative sections of a wild-type and a Pik3c2a+/− kidney at 6 weeks after I/R is shown (C). Graphs provided in (D) represent the percentage of tubular cells showing a PCNA positive nucleus over the number of tubular cells per section at either 48 hours or 6 weeks after I/R. For all groups n=6 mice. (E) Representative micrographs showing that the majority of cystic lesions is positive for pErk and pS6rp in sections from a Pik3c2a+/− kidney at 6 weeks after I/R. PCNA, proliferative cell nuclear antigen. Analysis of proliferative pathways in Sh1 and Sh2-IMCD3 showed an increased phosphorylation of Erk and S6K, mirroring the condition of Pik3c2a+/− kidneys (Supplemental Figure 10). 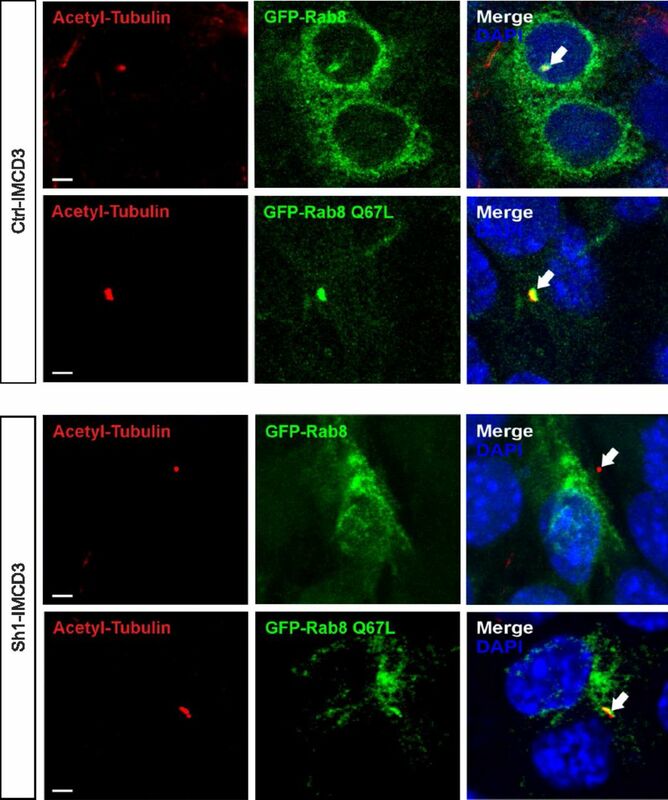 Given the effect of Rab8 activation on PI3K-C2α-dependent polycystin-2 trafficking to the primary cilium, Pik3c2a-silenced IMCD3 cell lines stably expressing either green fluorescent protein (GFP)-Rab8Q67L or the empty GFP control vector were established. Analysis of the mTOR and MAPK pathways showed that loss of PI3K-C2α in control cells induced the expected upregulation in Erk and S6K phosphorylation (Figure 7A). Conversely, expression of Rab8Q67L in Pik3c2a knockdown cells significantly reduced these phosphorylation events, rescuing Erk and S6K phosphorylation to the levels of PI3K-C2α-competent cells (Figure 7A). Reduction of PI3K-C2α levels impairs polycystin-mediated control of proliferative signals in IMCD3 cells. (A) Western blot analysis of the activation of the MAPK (pErk) and mTOR (p70S6K) pathways in control and Pik3c2a-silenced (Sh1-IMCD3) cells expressing either GFP-Rab8Q67L or a control plasmid (GFP-empty). Constitutive Rab8 activity is able to rescue excessive proliferative pathways in Sh1-IMCD3. Graph provides the mean quantification value of n=5 independent experiments. (B and C) Western blot analysis of CREB, MAPK, and mTOR pathways in Sh1-IMCD3 cells in serum (B) and 48 hours-starved (C) conditions. Treatment with the polycystin-2 agonist triptolide at a concentration of 25 nM for either 6 (CREB) or 48 hours (MAPK, mTOR) was able to rescue abnormal activation of these pathways. 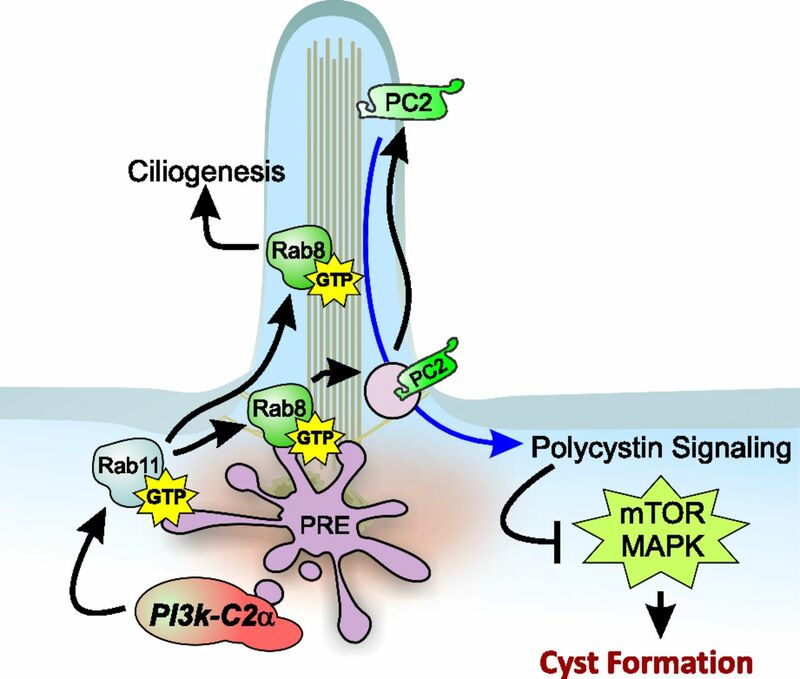 To determine whether Rab8Q67L rescues overactivation of the mTOR and MAPK pathways by either restoring polycystin transport to the cilium or promoting cilium elongation, wild-type and Pik3c2a knock-down IMCD3 cells were stimulated with the polycystin-2 agonist triptolide (Figure 7, B and C). This small molecule enhances polycystin-2 activity35 but has negligible effects on primary cilium length36(4.4±0.3 and 4.5±0.2 µm in triptolide-treated and untreated IMCD3 cells, respectively). The response to triptolide was evaluated in IMCD3 cells grown either with or without serum, to promote deciliation or ciliogenesis, respectively. In the concomitant presence of serum and absence of cilia, mTOR, MAPK, and cAMP-responsive element binding protein (CREB) were equally phosphorylated in either wild-type or Sh1-IMCD3 cells (Figure 7B). On the contrary, under serum deprivation, only Sh1-IMCD3 cells showed mTOR, MAPK, and CREB hyperphosphorylation. Treatment with triptolide did not change the background phosphorylation in deciliated cells but was able to rescue the hyperphosphorylation in ciliated Sh1-IMCD3 only (Figure 7C). These results show that the sole potentiation of ciliary polycystin-2 signaling is able to restore normal mTOR, MAPK, and CREB pathway activation in Pik3c2a-silenced cells. Altogether, these observations further indicate that PI3K-C2α is crucially required for the transport to the cilium of polycystin-2 where it relays signals protecting from cystogenesis (Figure 8). Graphical representation of the role of PI3K-C2α in the prevention of kidney cyst formation. PI3K-C2α localizes in the pericentriolar recycling compartment surrounding the base of the primary cilium in cells of the kidney epithelium. In this vesicular compartment, PI3K-C2α promotes the Rab11/Rab8 activation cascade, which allows Rab8 targeting to the primary cilium. Ciliary Rab8 regulates cilium elongation and entry of ciliary proteins, including polycystin-2. High levels of polycystin-2 on the ciliary membrane are necessary for counteracting intracellular pathways, such as the mTOR and MAPK pathways, which constitutively induce proliferation of renal cells and favor the development of kidney cysts. PRE, pericentriolar recycling compartment. Signals from the primary cilium are essential to ensure the correct development of kidney tubules and to prevent cyst formation.1,14 Our results indicate that PI3K-C2α modulates trafficking of primary cilium-bound cargo proteins such as polycystin-2, thus allowing polycystin-mediated control of proliferative signals in kidney tubular cells. This function is strictly dose-dependent and a 50% reduction in PI3K-C2α expression is sufficient to cause primary cilium abnormalities in kidney tubules as well as to predispose to renal cyst formation. In mouse embryonic fibroblasts, PI3K-C2α activity controls the Rab11/Rab8 cascade at the PRE and regulates a vesicular trafficking process, targeting cargo proteins to the primary cilium.20,23,24,26 Consistently, silencing of PI3K-C2α in collecting-duct derived IMCD3 cells impaired Rab11 activation in a dose-dependent manner and prevented the ciliary localization of Rab8. This Rab GTPase represents a key hub regulating selective entry of proteins inside the ciliary compartment21,32,37 and delivery of material required for cilium elongation.23 In agreement, silencing of PI3K-C2α in IMCD3 cells resulted in impaired targeting of polycystin-2 and reduced cilium length. Importantly, both defects could be rescued by the expression of a constitutively active form of Rab8. 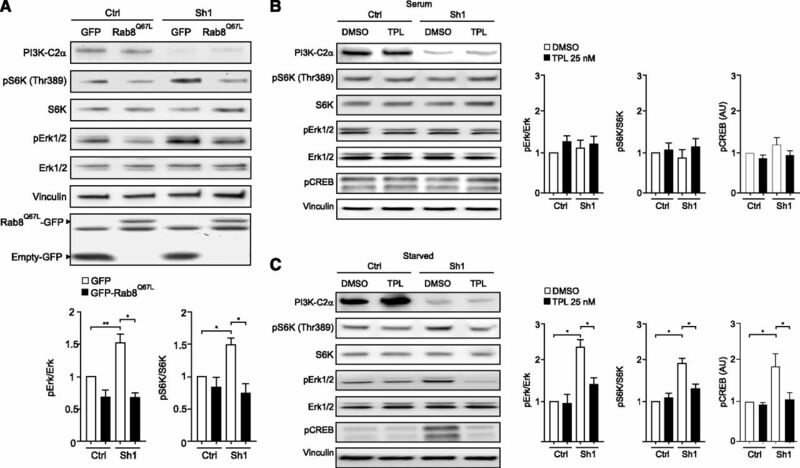 Altogether these results provide the genetic proof that PI3K-C2α is functionally required to promote Rab8-dependent cargo trafficking to the primary cilium. A link between Rab8, polycystin-2 ciliary targeting, and kidney cyst development is suggested by studies on the Exocyst complex3,22,38 and on other genes epistatic to Rab8.39,40 Despite the reduced expression of PI3K-C2α leading to decreased Rab8 activation and a significant decline in ciliary polycystin-2, heterozygosity for a Pik3c2a-null allele did not directly induce kidney cyst development in mice. This suggests that the levels of polycystin-2 (or of the polycystin1/polycystin-2 complex) in Pik3c2a+/− cilia remain above a threshold sufficient to protect from spontaneous cyst formation. Consistent with this hypothesis, a further decrease in ciliary polycystin-2 levels obtained by crossing Pik3c2a+/− with Pkd2+/− mice was sufficient to enhance the frequency of cyst formation. The anti-cystogenic function of polycystin-2 requires the formation of a dimer with polycystin-1 on the ciliary membrane,41 and a concomitant reduction of polycystin-1 and polycystin-2 levels increases cysts formation in mouse kidneys.31 Consistently, reduction of PI3K-C2α levels exacerbated spontaneous cyst formation also in a Pkd1 heterozygous background. Given that polycystin-1 and -2 mutually influence their ciliary translocation from the Golgi apparatus,41,42 enhanced cystogenesis in Pik3c2a+/−;Pkd2+/− mice is in agreement with an effect of PI3K-C2α on the ciliary trafficking of both proteins of the polycystin dimer. Although the onset of spontaneous cystic lesions in the kidney of either polycystin-1 or -2 heterozygous mutants is a rare event,29,32,43 these mice are prone to develop cysts in response to an insult such as renal ischemia.32,33 This indicates that subtle changes in polycystin dosage are sufficient to weaken the anti-proliferative effect exerted by this pathway in kidney tubules and to increase susceptibility to cyst formation after damage. In line with this view, ischemic damage of Pik3c2a heterozygous kidneys caused exaggerated activation of proliferative signals that are considered to be under polycystin control, such as the mTOR and MAPK cascades. This is in agreement with a reduction in the levels of p21/cdk, a negative regulator of cell cycle induced by polycystin signaling.34 Downregulation of PI3K-C2α in IMCD3 cells mirrored the dysregulation of MAPK and mTOR pathways observed in vivo. However, these alterations could be avoided by restoring polycystin-2 function using two different strategies: the rescue of polycystin-2 ciliary translocation via a constitutively active Rab8 and the hyperstimulation with triptolide of the low levels of ciliary polycystin-2 present in PI3K-C2α knock-down cells. Therefore, these observations demonstrate that a failure in polycystin-2 function, rather than a general primary cilium shortening, is the major cause of the alterations in proliferative signaling pathways detected after down-modulation of Pik3c2a. Furthermore, this evidence clearly links the polycystin-2 trafficking defect to unrestricted tubular proliferation in Pik3c2a heterozygous kidneys. 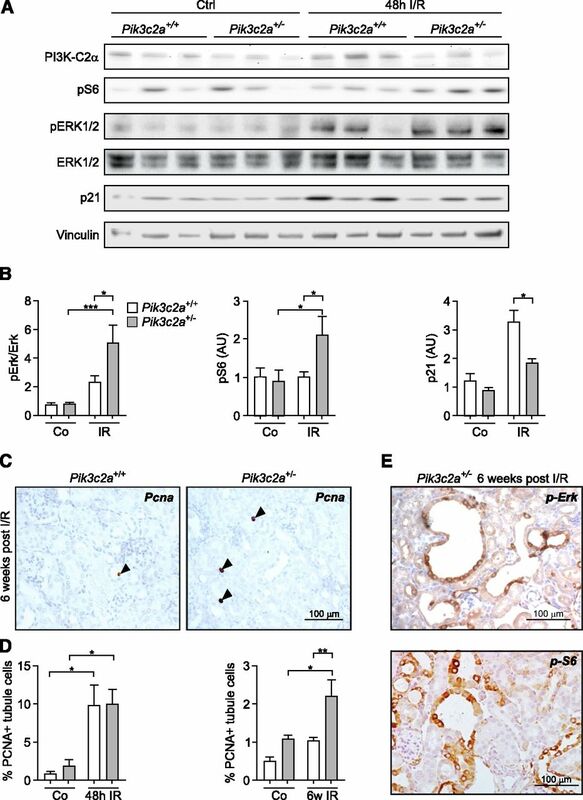 Altogether, these results highlight a PI3K-C2α/Rab8-mediated targeting route to the primary cilium that critically contributes to protect the kidney from cyst formation and indicate Pik3c2a as a disease modifier gene in PKD. Pik3c2a−/− mice were generated as described in Franco et al.26 Chimeric mice were either intercrossed to maintain a mixed C57/BL6-SV129 background or backcrossed for eight generations in the BALB/C background; wild-type littermates from heterozygous crosses were always used as controls. Pkd2+/− were kindly provided by Dr. S. Somlo (Yale University),29 while Pkd1+/− were provided by Dr. A. Boletta (San Raffaele).30 Double heterozygous animals were obtained by intercrossing either Pkd1+/− or Pkd2+/− (both in the C57/BL6 background) and Pik3c2a+/− mice backcrossed for 12 generations into the C57/BL6 background. Silencing was achieved through lentiviral infection as described in Franco et al.26 Triptolide (Invivogen, San Diego, California) was added to either serum treated or 48-hour serum-starved cells at a concentration of 25 nMol. GFP-Rab8a was generated using PCR amplification and cloning into pEGFP-C3 expression vector. GFP-Rab8aQ67L was kindly provided by Dr Peranen (Helsinki University, Helsinki, Finland). Primary antibodies: anti-acetylated-tubulin monoclonal (6–11B-1; Sigma-Aldrich, St. Louis, Missouri), anti-acetylated-tubulin polyclonal D20G3 (Cell Signaling Technology, Danvers, Massachusetts), anti-PI3K-C2α monoclonal (anti p170 #611046; BD Transduction Laboratories, Franklin Lakes, New Jersey), anti-polycystin2 D3 monoclonal (Santa Cruz Biotechnology, Dallas, Texas). A microvascular clamp was applied, in 6-week-old male mice, at the renal pedicle of the left kidney for 35 minutes to induce a transient ischemia; the right kidney was left untouched and used as a control. For quantification of tubule dilation, cortical sections were stained with hematoxylin-eosin, three 20× fields/kidney were photographed and the TD/cystic index was calculated as described32: a grid composed of 13.6 μm-spaced dots was overlapped on the images, the tubules were counted/scored according to the number of dots present in their lumen. Tubular dilation (Td), two dots; microcysts (MC), 3–9 dots; cyst, more than nine dots. Values were reported as the mean±SEM. Statistical significance was calculated with one-way ANOVA and Bonferroni post hoc tests. One, two and three asterisks (*) in all the figures indicate significance with a P value <0.05, <0.01 and <0.001, respectively. All the analyses were performed with the software PRISM5 (GraphPad Software Inc., La Jolla, CA). The authors would like to thank Dr. J. Peranen (Helsinki University) for providing the GFP-Rab8aQ67L plasmid and Mossino M. and Fioravanti A. for technical help with histology. This work was supported by grants from Progetto Ateneo Compagnia San Paolo, Italy, (EH), AIRC, Italy (EH), Regione Piemonte, Italy (EH), Leducq Foundation, France (EH) and Telethon Foundation, Italy (AB and GRM). The CMMI is supported by the European Regional Development Fund and the Walloon Region. I.F. and J.P.M. contributed equally to this work. This article contains supplemental material online at http://jasn.asnjournals.org/lookup/suppl/doi:10.1681/ASN.2014100967/-/DCSupplemental.